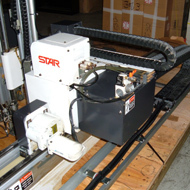 Star Automation Servo Robot designed for use with injection molding machines. This unit actually has 4 axis of true servo motion. 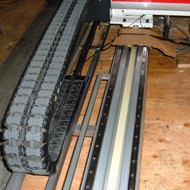 or the robot can be used as a normal 3-axis servo robot with the runner arm simply disabled. 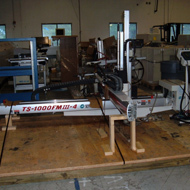 The unit is in exceptionally clean condition, and is skidded and ready to ship. depending on application and safety gate arrangement of your press. 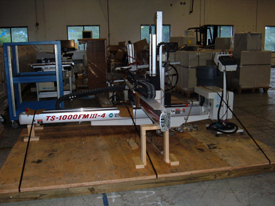 Ideal for parts and runner removal, stacking, degating, palletizing, etc. 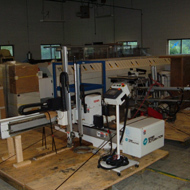 Main Parts Arm: 1000mm True Servo with linear guide. Pneumatic wrist at arm end. Traverse Stroke: Approx 1600-1800mm. True Servo. Linear guide. Runner Arm: Pneumatic with linear guide. Mech. Runner gripper included. 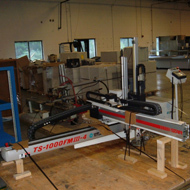 Crosswise Stroke Runner Arm: True Servo with Linear Guide. 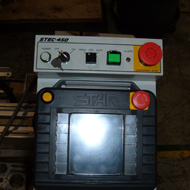 Controller: Star Stec-450 (includes floppy drive and disc). Main Controller Location: On robot beam. Controller Pendant: Mounted on pedestal with casters. 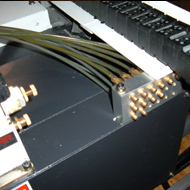 Lubrication: All points plumbed to common manifold in rear. Note: A basic end-of-arm tool with 4 vacuum fixtures (no cups) is included.